Prepare the rice according to the instructions. 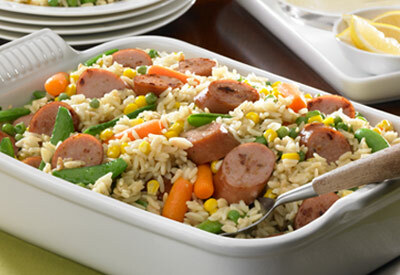 Ten minutes before it is done, stir in the Johnsonville Apple Chicken Sausage and the frozen vegetables. Continue to cook partially covered until finished. Re-season lightly with salt and pepper to taste. Spoon on dinner plates, serving crusty bread on the side.